Parkway Barbers is a full service barbershop located at 1414 Centre Street in Roslindale, MA. Formerly known as West Roxbury Barbershop on Spring Street in West Roxbury, MA. We specialize in traditional cuts for men and children. 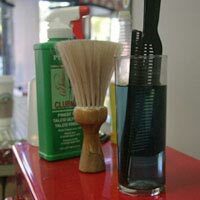 Our services range anywhere from beardtrims and shaves to shampoos and haircoloring. Affordable prices, flat screen TV while you wait and child friendly waiting area too!